“A tobacco aroma with sweet undertones of honey. A pure aphrodisiac”. This is how today’s fragrance is described by Kilian. And Kilian’s perfumers know their stuff so I am sure this potion has caused more than one baby in its lifetime. For me…no. Unfortunately. I would love to love tobacco and honey. 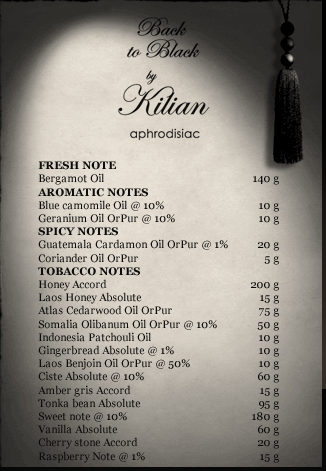 I want to love every Kilian fragrance because the ones that I do love I am completely enchanted by. And I know enough to know that every black bottle with this name has been created with great passion and dedication. Also I am interested in all sorts of connections between the olfactorial world and the emotional world. So I am sorry to say, “Back to Black: aphrodisiac.…our paths will never cross again”. The first two hours I was intrigued by this perfume. I felt like I smelled like a male rock star. Crude, restless, eager, fierce. I did however not feel like that rock star, but like I had borrowed Mick Jaggers perfume. A bit weird but interesting! However the fierceness disappeared and turned into something more like heavy incense at Midnight Mass. Bit too much of it for me, I couldn’t carry it off, but still… interesting. But then by the end of this day suddenly something entirely different emerged. To me, it resembled heavy roses and soap. I know a lot of people think that sounds beautiful but it is just not my thing. I felt like when you have not rinsed the soap away from your hands and that experience to me is really uncomfortable, just the thought of it makes my head itch. But this is personal, the people in my company did not react like this at all or even sense that sort of thing. My reflections do not mean anything else than this, a bad match simply and I would love to hear someone else describe a contrary experience of this fragrance to me. In fact, when you google “kilian aphrodisiac review” you will find exclamations of great joy. And this, is one of the things that makes perfume so interesting. So, please look at the notes below and if you like the sound of them look up reviews on blogs, Fragrantica etc. This could be a sensational discovery for you. And now I am going to look up the notes – which I have in fact not done before this very moment because I wanted to give you a sincere reflection without having “the right answer”. There is no other way to describe spring’s arrival in the Swedish capital than… shy. From an olfactory perspective you can feel it approaching as the air gets softer and sweeter. In the evening though it smells of Baltic winds and gravel. Hard and cold. But there is a scented cure for everything. Some time ago I received a collection of samples from Kilian and they have been waiting for their occasion ever since. The occasion is now. My plan is to go through them, one per day, and share my reflections with you. By the time I reach the eleventh one maybe spring will be here. 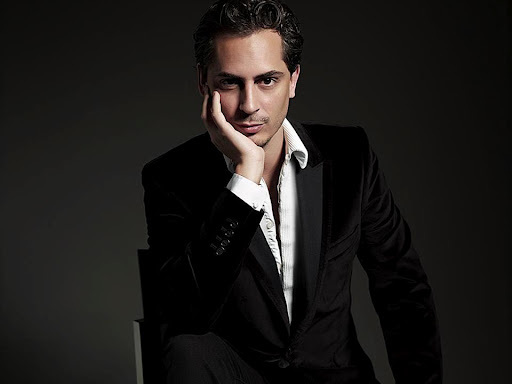 Kilian Hennessy, for those of you who are not familiar with this brand and man, is a perfume creator who is also the grandson of the founder of the LVMH group. This of course is not irrelevant, he was brought up in a family dedicated to cognac and early in life encountered the phrase ”angels’ share”, a term used to describe the percentage that for unknown reasons evaporates from cognac cellars. This was one of the things that led Kilian towards perfumery. After writing a thesis on the semantics of odours he trained alongside the noses of Dior, Paco Rabanne, Armani and Alexander McQueen before eventually (2007) creating his own brand. I am an admirer. The fragrances are exquisite and the perfume house takes much more devoted care of its brand and fans than most competitors. Just look at the website, it is pure dedicated seduction. So, back to my 11 Days With Kilian. Fragrance number one. I have been wearing it for a couple of hours now and it is an adventure of the mind. 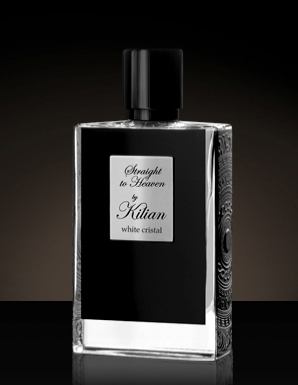 It is sophisticated but has that dark side twist that all Kilian fragrances have. All kinds of associations come to mind… ceremonies or rituals. Druids? Yes, it sounds crazy I know but try hearing an aria from Norma in the back of your head. It is ceremonial in a very sensual carnal way, a mix of incense and leather. Some moments I can’t feel it on my skin anymore and I wonder where it went, then I make a slight movement and there it is. But like the scent of someone standing behind me rather than my own. Spiritual. It is the scent of a temple. Perhaps not a physical one out of stone with pillars, but rather the one inside of you. Unfortunately, I am not sure this is a fragrance for me. It seduces me but it is not ”mine”. Fortunately… I had an instant association with someone else. And I think this could be a scent for that person. We will see.